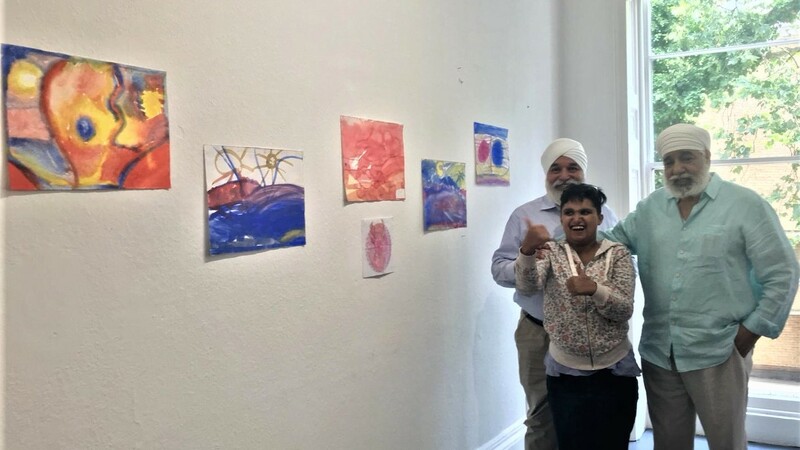 Jai Kaur Bhamra, during her visit from Germany, held her first exhibition of abstract colour paintings at the prestigious Arts and Business College of London, on a sunny afternoon of Wednesday, 8th August 2018. Jai was accompanied by her father Jaswinder Singh Bhamra, uncle Amarjeet-singh Bhamra and Dr Mahesh Mathpati, a close family friend. She was warmly received by Jane Jia, the curator who was immensely happy to have Jai and her work displayed at her gallery. She encouraged Jai to keep producing further work of knowledgeable integrity. Jai is influenced by the anthroposophical line of thought initiated by the philosopher Rudolf Steiner. Having attended a Waldorf School in Germany, Jai’s art is often representational and abstract. She chooses colours and objects to express herself and her zest for life, despite being of special needs.